Along with last week's post, here is another option for practicing the comparative and superlative forms introduced in 2nd grade junior high textbooks. The idea is simple, yet it's a hit with every class I've used it in. Prepare a list of 24 two-word pairs (better) or three-word sets (best), like "watermelon/strawberries" or "Aquarius/Pocari Sweat/CC Lemon" and arrange them in two columns. We've hosted a pre-constructed worksheet here at AccessJ. The students choose a word from each pair or set and write it somewhere in the bingo card at the bottom of the page. They're trying to guess which of the two or three items the teacher (you) likes better or the best. To play, have volunteers or selected students stand up and ask a question about a word pair or word set on the sheet. If it's a pair of words, they ask, "Which do you like better, A or B?" If it's a set of 3 words, they must ask, "Which do you like the best, A, B, or C?" All other students must listen carefully to your answer and mark a circle or an 'X' in the appropriate box on their bingo card. For less advanced classes, consider using only 2-word pairs (an exercise using better only) or only 3-word sets (an exercise using best only). However, I like to use both on the same sheet in order to emphasize the different situations in which each is used. For best questions, this is also an ideal opportunity to practice the specific pronunciation of alternative questions (選択疑問文, sentaku gimonbun): A rising sound for the first alternatives in a list and a falling sound for the final one before the question mark. -Some students will take a long time to choose items and fill out the bingo board. One solution is to give the students a definite time limit (e.g. 5 minutes on a beeping stopwatch or egg timer). When their time is up, no more words may be written on the bingo board--making it much harder to get a bingo. If you don't mind allowing them to continue writing, you can let any stragglers continue filling out their board after you've started playing. -If students don't go through the lists in order as they write or forget to put check marks beside list items they've already written onto their bingo board, they may get to the last one or two spaces in their bingo board and not know which items they have left to write. 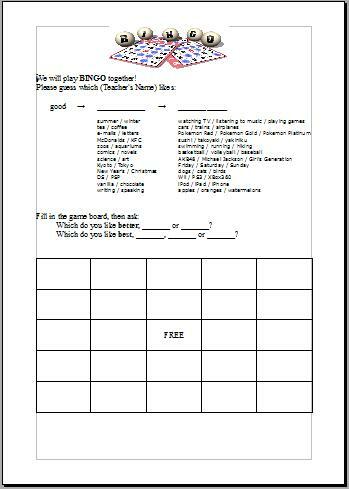 -To increase the number of bingos in a class, I allow students to call out bingo if they get a row of all correct answers or a row of all incorrect answers ( × ビンゴ, batsu-bingo). The FREE space can be counted as a circle or an 'X.' In most classes, about half of the students in a class end up with bingo. -If you like to award stickers or other items, you can choose to do it in order of achieving bingo (first 10 students get a sticker) or, since probably not all students will get a bingo, to all students with at least one bingo at the end of the match.